A SLE freestyle/freeride kite which is also suitable for the waves. A wave allrounder. According to the designers this gives the kite extra stability and a more rigid frame. Slingshot designed a crossover kite for freestylers and freeriders that enjoy riding in waves. Using the experience gained from the Fuel (C-Shape) and the RPM (SLE kite) Slingshot designed a new Delta kite called the Rally. 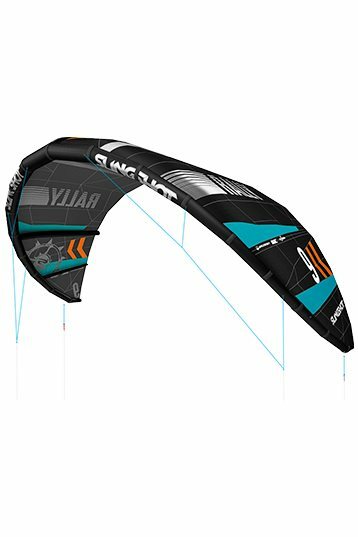 The Rally is the first open delta C-kite combining the advantages of a Delta with the performance of a C-Shape. The first thing you notice when pumping the Rally is the open Dalta shape. Even though the Rally has an open shape and only three struts the kite has an extremely rigid frame. The Rally has a one-pump system and is reinforced where the kite wears the most. The bulging middle strut and the short wingtips are also notable. Once on the water the small turning circle and direct reaction to commands is noticeable. Bar action results in direct action from the kite. The steering pressure is low and the power buildup gradual. the Rally gives a lot of feedback to the bar through the steering lines and power/de-power commands are felt instantaneous. Fully de-powered the Rally's reaction to steering commands decreases, particularly in its low-end. In the high end the reaction is always good and one of the strong points of this kite. The pop of the Rally is fairly explosive, both hooked-in and un-hooked. The boost, on the other hand, is more gradual and is distributed over the turning circle. The basics like re-launch, stability and safety are fine and get a good score. When grading the kite the Rally got a high score on many characteristics. The Rally gets good scores on the characteristics that make it suitable for freeriders, freestylers and wave riders. Personally I am very impressed by the wave characteristics of the Rally. This crossover kite with the splitstrut and the distinct shape is a success. Easy to handle, light bar pressure, good feedback, quick reaction to commands and easy power control. For freestylers the Rally offers good pop and boost. The sweetspot requires some technique, but due to the light bar pressure the Rally is very suitable for unhooked tricks. Riders that like to go out into the swell will love the Rally. It reacts quickly, it always gives you feedback, builds up power gradually and provides you with small turning circles anywhere in the wind-window. 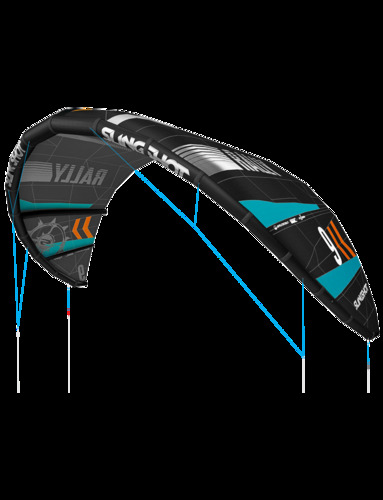 If you are looking for a allround kite with good wave-characteristics you should give the 2011 Slingshot Rally a try! Bar pressure increases with increasing wind, but steering the kite remains easy. Could be better for a wave kite, but in it's high end this is not a problem. The rally always gives feedback through the steering lines, in turns and in flight-lines. Can be very small, depends on the command. Pressure remains in the turn. It depends where and from whom you buy. Buy from a shop in Sweden and its alot. Buy direct from importers in some countries then its low. $1700 is RRP for a 12m but it's possible to order and get deals. ie, Philippines. Thailand, Dubai etc. Europe and US are more expsensive. How much does Slingshot Rally 2011 12m cost? There are to many colors to write about. I cannot find anywhere colors of rally kites, How colors I can buy. The left side is the manufacturer specifications. But you got a good point there! We change it because we good other questions about that. A good reviewed wave kite should be show when pressed on the wave button. So this Rally is a fast kite, excellent for waves. Why can't I find it when I press the wavekite button?